Or come to see us at one of our pubs - The Castle Tavern, located on the market square in Richmond, or The Hildyard Arms in Colburn. There, you may relax in comfy traditional pub surroundings while you enjoy one of our real ale offerings. Owners Pete Loft and Chris Wallace have worked together in brewing for more than 25 years. But despite working in some of the biggest brewing companies in the business, they firmly believed that a micro-brewery with the best ingredients and the right brewer could produce some of the best tasting beer possible. So that’s what they set about creating when they took over Richmond Brewing Company in 2013 - a back-to-basics micro-brewery that offers a quality pint at a reasonable price. When Pete and Chris visited Richmond in North Yorkshire and fell in love with both the town and the brewery, they knew they had found the perfect place to brew great-flavour beer in a friendly micro-setting, using local products wherever possible to produce a beer drank by local people. What they needed next was a brewer who shared their vision and their enthusiasm for beer and brewing. And that’s just what they found in Jonathan Steedman – an inexperienced but enthusiastic home brewer keen to prove himself. Jonathan was trained within Richmond Brewing Company and soon showed that he had a talent for brewing as well as a passion for the job. The team is completed by Brosa, who uses her experience in retail management and administration to keep things running smoothly. 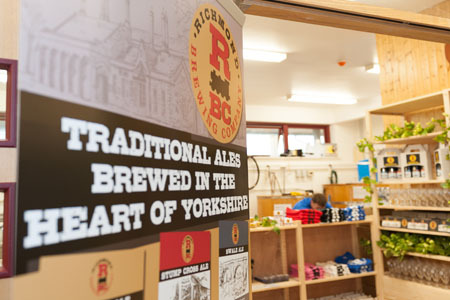 Richmond Brewing Company brought brewing back to Richmond for the first time in 180 years – incredible given Yorkshire’s rich tradition of brewing. And it’s hard to imagine a better place to brew traditional ales than by the banks of the River Swale within Richmond's Grade II listed Victorian former railway station. Opened in 1847, the station closed in 1963 but was brought back to life by a not-for-profit community enterprise that saw it renovated to become a fabulous destination for locals and visitors alike. As well as cinemas and art exhibitions, our neighbours include an artisan delicatessen and bakery as well as an ice-cream maker so it’s a perfect place to come to sample some of Yorkshire’s finest – including our beer. As a local enterprise, our brewery is at the heart of the Richmond community and we’ve chosen to support two charities with strong local links. The Georgian Theatre Royal is a national treasure - the country’s most complete Georgian playhouse and a part of the fabric of Richmond for more than 200 years. Help for Heroes has helped injured servicemen and women achieve great things and with Phoenix House Recovery Centre just a mile or two away at Catterick Garrison, we wanted to show our support for their amazing work.